I giggled a little when I opened the box and saw this book cover staring at me. 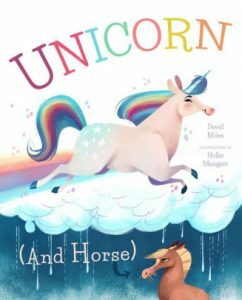 Unicorn (And Horse) is a new children’s book by David Miles and illustrated by Hollie Mengert. The most enjoyable part of the book for me was the illustrations. They showed the contrast between Horse and Unicorn’s looks, and the contrast between their personalities and lives, amazingly well. My little boys, who are five and seven, of course, liked Horse better, probably because it wouldn’t be manly to like Unicorn, even though, ironically, he was a boy. My oldest son, Casey, who is 13, said it was a really funny and sweet book. He could appreciate not only the illustrations, but also the story. David Miles starts the book by comparing Unicorn and Horse in very funny ways. You can’t help but laugh as they couldn’t be more opposite. You learn pretty quickly that Horse is quite jealous of Unicorn, whom everyone loves. One night, Horse has to make a choice to help Unicorn, who has been kidnapped, or do nothing and not have to live in his shadow anymore. After thinking, and thinking, and thinking, he decides to rescue Unicorn and the they become best buddies, who share the different aspects of their lives with each other, becoming more well-rounded as a result. For me, there was a missed opportunity when Horse was thinking. I would have liked to see a page or two of what he was thinking about, and what ultimately led him to look beyond his jealousy and save Unicorn. It was very clear to me when I read it the first time that that was a plot hole. Overall, though, it was a very cute book that teaches that everyone has good qualities, and you can be friends even with someone who is the seeming opposite of you. Check it out! Girls and boys alike will love it.